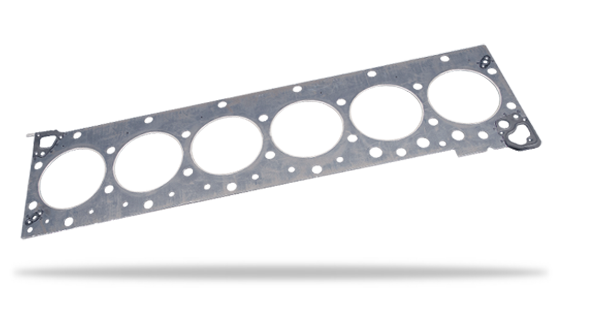 The Victocor® 500 cylinder-head gasket is composed of five layers. A perforated steel sheet is adhesively bonded to each side of a thick steel center layer, and thin layers of graphite are mechanically bonded to the perforated steel sheets to form the outer surfaces. This results in a solid center layer to support combustion pressure and thin graphite layers for fluid sealing. The center layer provides support to the combustion seal and stabilizes flange motion. As a result, high blowout resistance and exceptional flange durability are achieved.